If you took a dash of WordPress, added a sprinkle of Twitter and a tablespoon of Facebook, you just might end up with Glipho…or, at least, what Glipho hopes to become. Billed as "the social publishing engine," Glipho is a cloud-based service that aims to build a social community of writers and help those writers increase their visibility. To begin using Glipho, you sign up with an existing account: The available choices are Facebook, Google, LinkedIn, and Twitter. You build your Glipho feed by picking writers to follow, though you have to select them based on a wide topic area (such as "technology" or "sports") and without seeing their writing at first. You can fine-tune these selections later, though, as you browse the site. Glipho's home page displays the blogs in small blocks that show an image from the post as well as a snippet of the content. And Glipho's site has plenty of content to browse. The site posts content from trending writers—those whose posts are getting attention from other users—on the home page, as well as other posts the Glipho team chooses to highlight. You also can search for specific content, or browse by interests, topics, writers, and more. 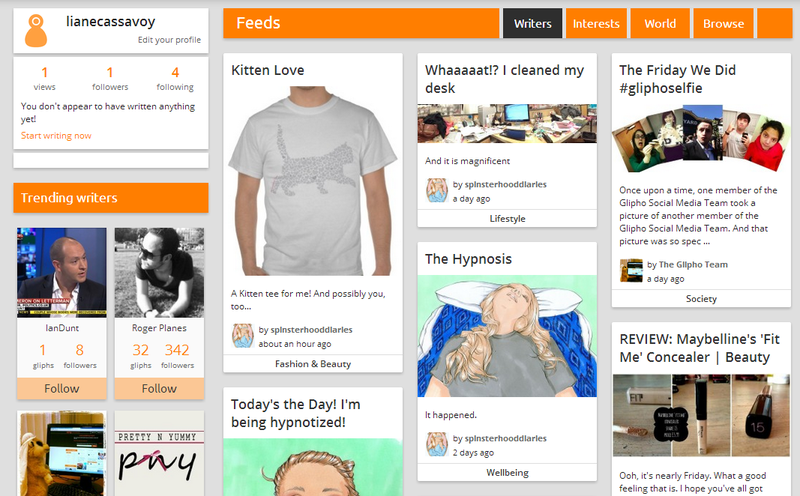 The overall layout is attractive and easy to browse. 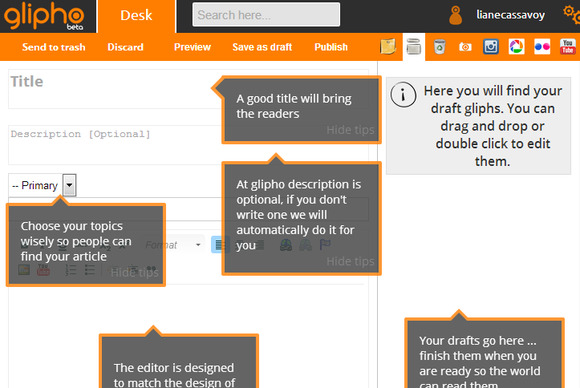 Writing content is just as easy, thanks to Glipho's attractive layout. The blogging tools allow you to compose posts directly on the site, and you can import posts from Blogger, Tumblr, and Wordpress. Unfortunately, you can't automate the import process so that every new post is imported to Glipho from your existing blog. You'll have to import each new piece of writing individually. Glipho also restricts what types of posts you import. You can't, for example, import photo-only posts from Tumblr, as Glipho requires that any content you import contains at least 150 words. 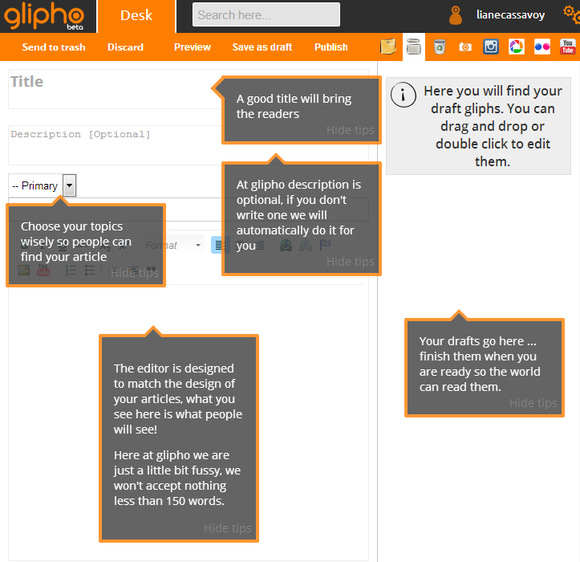 Glipho also provides tools for promoting your work and your profile as a writer. You can create a social profile that displays next to your writing, showing your Facebook, Twitter, Pinterest, Instagram, Linkedin and Google+ accounts for readers to find. And the Glipho team promotes some of the work on the site through their own social media accounts. Glipho offers plenty of tips as you begin to write. Posting your work on Glipho could gain you a new audience for your work, and it could help your standing in search engine results. Certainly, the site will allow new readers to discover your work…but it's limited by how many people visit the site. Until Glipho's audience grows to a critical mass, the site's social reach is naturally limited. Glipho offers easy to use blogging tools and options for boosting your audience, but the site is limited by the size of its own audience.